I have finally done it! I have cleaned my nemesis of a room. Well, there is one really high shelf to go with boxes of wool. My craft room now has a floor – who knew? 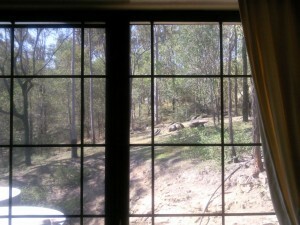 It also has lovely windows to look out. It has a cutting table and I can identify the sewing machines. It has taken me 2 weeks, from 8AM until about 3PM, 5 days a week. My ever helpful 21 year old suggested about half way through, just after my “I’ve had enough” rant, that I should just shove it all back in there. That’s how it got to be a disaster in the first place. We moved in 11 years ago and I knew 2 boxes that were put in the dim dark depths under the table. One was a very old dinner setting that I have no intentions of using but don’t know what to do with. It looks different than I remember though. The other box was a serious shocker. It has drawings from when I was in kindergarten. That was 1971. My mum is ecstatic, this is a good thing. It had other odd things from a similar era. I am only assuming that in one of my mum’s moves she managed to leave the box here, we use to look after some of her stuff whilst she moved. Wool – yarn – cottons – fibers – WIP’s. More and more of them kept surfacing, the stuff just kept coming out of the woodwork so to speak. 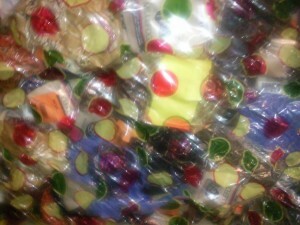 I have put yarn in boxes and in vacuum sealed bags to save some space. Unfortunately, they have a white back and are clear with colored spots on the front that make it really difficult to see what is in there once squished. I have all my cotton threads, a shop full of them, in a cupboard and my really fancy and hand spun ones on another shelf in the same cupboard, there aren’t many of them. 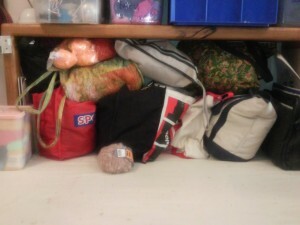 I have all of my WIP’s at the back of my table under the shelf there. My little ‘random ball of wool’ is now there as well. I couldn’t put her in a bag with the masses after she has been keeping me company for so long in front of my computer. So many unfinished items, all crochet baring one. I remember doing the knitted one before my second child was even thought of, that’s pre 1996, it is a teal mohair cardigan. It just needs a sleeve so I should finish it. Why I never did is beyond me, other than I hate knitting so in actual fact I am not sure why I started it. 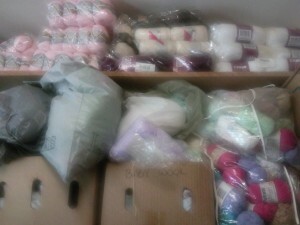 I am about to embark on the 2012 FreeForm crochet challenge that I get involved in every year. The topic we have to follow will be decided via poll results on November 2nd. I was very tempted to start keeping yarns out for that. However, not knowing what theme is going to win that would have been silly wouldn’t it? My mind is running rampant though. The other yarns have also sparked my interest in other projects. An afghan for my step dad and one for my mother to put over their knees whilst watching TV in the winter. I almost bundled that yarn up separately and kept it out, however once again that is silly. It is coming on summer here and it will be a while before I get started. I do need someone to have more babies though. There seems to be an excessive amount of baby yarn. I also found yarn in a paper bag from a store that has not existed in about 21 years (‘McDonald and East’ for the Australians). It is a darkish gray pure wool – why did I purchase it? I do remember it was 20c a ball, there’s probably about 40 of them although they are very small. The one thing I was looking for and is missing, is an afghan that is just a large granny square. I started it when I was about 10 or 11 and never finished it. Mum and dad purchased me skeins of pure wool from a sheep farm, once again I don’t know why. That began my obsession with natural fibers. It was packed away because I got fussy as I got older and it was autumn colors which I decided I didn’t like there for a while and also it wasn’t very neat. The tragic part about this is although the room was a disaster I knew exactly where I had stashed it. Imagine my shock and disappointment when it wasn’t there? Funnily enough there are two unwound skein of the wool there. Gremlins? There is still the high shelf to go so I am hoping I have moved it up to there at some point. Anyway – now the room’s pretty well done except for the high shelf I can start dreaming of more projects to start and never finish. I have a new lease on life as far as crochet goes. I was in a bit of a slump. If I enforce my 15 minute rule all would be okay. PS – sorry about the quality of the photos! This entry was posted on Thursday, October 13th, 2011 at 12:00 AM by Veronica Smith	and is filed under Fun Ramblings. You can follow any responses to this entry through the RSS 2.0 feed. You can leave a response, or trackback from your own site. glad you had success – I will have to turn my attention to my craft room soon – at the moment I am still frightened of it! Why do you have so much stuff?! *sigh* in my next life I want a craft room! I have things stashed all over the house. Instead of the vacuum bags that are hard to see through, why not just get 2-3 gallon zipper bags? I buy a box of 2.5 gallon zipper bags every few months. I can separate different small projects or finished items in them…and I re-use them until the zipper fails. as for the baby yarn…just start making stuff. You could sell the finished items at a craft show, or maybe donate them to a good cause. There are charities here ( in the US) who give hand knit/crochet items to families who have had a fetal demise or still birth. That way the family has something appropriate to dress the baby in for family to say their good byes…and maybe *something* tangible to put in the child’s memory box. The children’s hospitals like to have a stash of handmade baby blankets and quilts for babies in the NICU. First it covers the incubator ( to muffle sound and block light), then goes home with the baby. Ha, ha, ha. I was waiting for the “Why do you have so much stuff” question. It’s an embarrassing amount of stuff i admit. And there is fabric, beads, buttons, zippers and a few other notions to go with that. That’s how i earned my money for many years, and i am hoping to get back into it again. i had my own shop – things multiply and yarns and the above mentioned items do not go off. i must admit i have added to my stash of yarns over the years so i am very guilty of that, and i get donations of yarns, patterns, fabrics from well meaning friends and relatives because “you’ll use this stuff wont you?”. I am hoping, well planning, to be back making and selling items from an on-line store not long after christmas. This stuff will all come in handy again. I don’t have a store, and never did, but I have almost as much yarn as you do. It just multiplies by itself. Sarah, great idea for the baby yarns. I do make burial bonnets for the SIDS (cot death) association. They need bonnets on the bubs due to a scar from autopsy and many parents don’t have bonnets in this climate. I have spoken to them in the past about whole outfits but the babies have their own clothes and blankets. The cot death associations is dear to my heart. I have it on my ‘to do’ list for today to contact the hospitals. Great idea. Veronica– some hospitals here also like “burial pouches” for preemies who don’t make it. Obviously a 1-2 pound baby is going to be too fragile and small to dress. My friend had a 35 week still born baby girl who only weighed 4 pounds. The little hand made layette she was given in the hospital meant a lot to her, even though she had clothes at home for her daughter. The thread can be used to make children’s summer clothes, like dresses. They look like fun colours that kids would like. wow ! 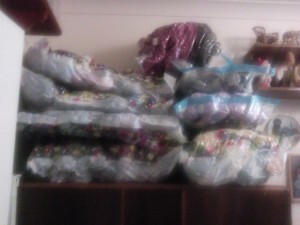 thats alot of yarn , i got bout 150 balls of yarn in my stash but yours looks like heck of alot more than mine! 🙂 I love your posts, Veronica! haha I am also cleaning my craft room. I think the supplies are going to eat me! Have fun in your new, clean room! Good for you girl. I wish I had half of the reserve yarn and thread you have. I have one cabinet, which naturally I have outgrown and also some zippered plastic bags that are stacked up outside the cabinet. My husband bought me metal “Hon” bookshelves at a used office funiture place. When, we retired, I put all my yarn in there. That was 3 years ago & recently had to straighten it up. Sort yarn by maker, Caron, Red heart, Lionbrand, ect. Use bottom shelves for the small balls of cotton yarn, lilly, which I put into wicker baskets that I bought at Dollar Store. This works for me. My sister also sugguested saving the “Crystal Lite” Containers to store extra Crochet Hooks, Stitch markers, yarn needles& a small tape measure. Label the spine with a magic marker. Put individual patterns into clear plastic & when I use a pattern, I make a copy of the original & use that! No more looking for that “Favorite pattern”. “THE ROOM” to sort out what belongs in there and what has just been thrown in there to store??? I’m about half done with the JUNK, but haven’t started on the odds and ends of yarn and sorted yarn skeins. Mom wants to help with that as half the balls are tnagled in messes and sometimes tangled together. I have about 10 baskets of yarn needing help. I’ve vowed not to buy more yarn until i use up most of the yarn and use allthe patterns i’ve copyed off line and put them in files and in order. another thing my mom loves to do >>>????? can’t figure out why, anyway I want to get it all cleaned out so those are the only two things she wants to do is handy and when done the room is done, She come in a month so lots to do.. I have MS and dh has emphasyma and just had lung cancer surgery. so dust ie: from the yarns and srings and two small dogs etc the rest of the house, I’m unable to keep clean ( lousy Housekeeper) hope to get hosekeeping help soon. at 70 and 65 and health issues we need help. dh on 02 24.7 and need less dust enviorment to breath better, and I love to keep my mind and hands busy with crochet. helps me feel useful with this D*&^ MS that limits me so much. So here we go, our room will be so nice when done, Right!, Right? Sounds like we all have a case of ‘stuff’…Sadly, as soon as I re-organize my studio, “stuff’ creeps in and never seems to have the smarts to be placed in it’s right spot until I buy something that I already have (ie: 7 size G hooks, 4,Hs and 4 Js) and then I pledge to straighten all this ‘stuff’ out. Nice,neat,organized and then slowly, ever so slowly, the ‘stuff’ creeps up the stairs and all the old ‘stuff’ starts screaming to be used….never ending! I’m jealous of your collection. All of my yarn fits into a 2’x3′ drawer under my bed. Hi ilove your posts and get inspired to crochet again.sometimes I restart unfinished items or start newer smaller projects.yes,yes I am also guilty of keeping my yarns in confusion and when I look at them I want to make so many projects and then keep yarn hanging around for weeks as my hands cannot work as quickly as I want them to!Occasionally,my hubby prods me to clean up and has bought me some large boxes too. yet I am inspired and will attempt to tidy up soon .Tell me how does one remember to put back left over yarn in the same bag if there is more than one ball and how do I store crochet patterns from booklets mags and photocopies from friends which are on paper? Filing does not work due to different sizes.your posts are super! Hi ilove your posts and get inspired to crochet again!Occasionally,my hubby prods me to clean up and has bought me some large boxes too. yet I am inspired and will attempt to tidy up soon .Tell me how does one remember to put back left over yarn in the same bag if there is more than one ball and how do I store crochet patterns from booklets mags and photocopies from friends which are on paper? Filing does not work due to different sizes.your posts are super! Hi .Tell me how does one remember to put back left over yarn in the same bag if there is more than one ball and how do I store crochet patterns from booklets mags and photocopies from friends which are on paper? Filing does not work due to different sizes.your posts are super! Sorry my message seems to repeat due to bad wifi connection. I was starting to feel good about someone having almost as much stuff as I have, but then you spoiled it by originally having a store. 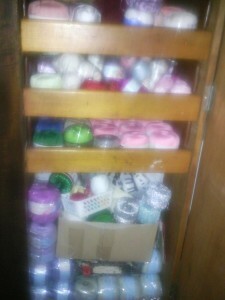 My problem is not only my yarn, but I also have paints, cardmaking stuff, enough embroidery thread to open my own store, and I make stuff all year round for charities, my hospital and for gifts, so that is all stored in that room also. I am also an avid reader, and have books all over. The books I want to keep, the ones I haven’t read yet, and the ones that I have set aside for paperback swap. I have never been an organized person. I know where everything is, but you would never know it to look at my room. My craft room is not only for crafts but for everything else you can imagine. My son moved to Oregon, but was sleeping in my craft room, so some of his stuff is still there. I have my Christmas (and all other holiday’s stuff) stored in that room, so I don’t have too much room left. It’s a daunting task to get it straightened out, but it needs to be done soon. I want to move South. Whenever I get on a kick to de-clutter, I always have things to give away. It also pains me to have money spent on gas (which could go toward yarn!) having groups come out to get the stuff or take it there myself. Post to FREECYCLE! This service lets you post free items on the net to folks in your region, neighbors, who want what you have. It’s operational all over the world, I understand, where a community has joined. Try it!